Hybrid clubs can improve your game on shots from the fairway or the rough. Hybrid irons and woods are specialty clubs designed to improve your golf game, particularly for players with high handicaps. They can be a rescue option for players who struggle to hit long irons and fairway woods. Hybrids utilize a shorter shaft than a typical club with a smaller club face. This lower sweet spot enables you to get your ball in the air. When hit properly, they add more control to your swing, resulting in a longer and more accurate shot. An assessment of your game will determine what type of hybrid is a right fit for you. Hybrids work best for players with slower swings. If you desire distance and control, you will want to try a hybrid with a flatter club face. If you want more distance regardless of control, you'll generally want a more rounded club face. If you feel comfortable hitting your long irons and woods, a hybrid club can still add a lot to your game, because of its versatility. For shots in the fairway, play the ball slightly forward in your stance, which should be about the same stance as you'd use for a longer iron. Take your normal, full swing and hit down on it. The ball should fly high and land soft. 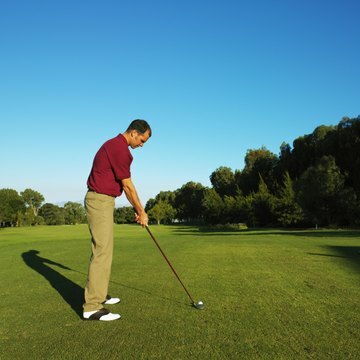 For shots in the rough, play it a bit farther back in your stance. If you're in deep grass, hit your hybrid like you would a short iron. One advantage of using hybrid clubs is that they're adaptable to nearly every type of shot. You can not only hit high shots into the green from the fairway or rough but also use your hybrid clubs to chip around the green. Still, it's best not to rely on your hybrid club too much. There are plenty of shots in golf that require you to hit the ball low. Examples include your ball being pinned underneath a tree or when you're playing in windy conditions. By practicing and experimenting with your hybrid club, you can add recovery shots to your arsenal and begin to lower your handicap. If you're struggling to hit with a hybrid, stand closer to the ball. Many golfers trying hybrids for the first time tend to hit them like woods. The result is a low-trajectory shot that tends to fly through the green. Remember, the shaft is shorter than most clubs you're accustomed to playing. So you'll need to practice to get the proper feel. Hybrid clubs vary greatly in price, but they're widely available in hundreds of styles and models because of their increased popularity. A low-budget hybrid iron can sell for as little as $20, but probably won't add much to your game. Typically, be prepared to pay $70 and up for a good-quality hybrid club and up to $300 or more for full hybrid sets of irons or woods.